Regarding wage growth at the national level, several participants noted a modest increase, but most still described the pace of wage gains as moderate; a few participants cited this fact as suggesting that there was room for the labor market to strengthen somewhat further. Although wages haven't been rising faster for the median individual, they have been for those who switch jobs. This distinction is important because the wage growth of job-switchers tends to be a better cyclical indicator than overall wage growth. In particular, the median wage growth of people who change industry or occupation tends to rise more rapidly as the labor market tightens. To illustrate, the orange line in the following chart shows the median 12-month wage growth for workers in the Wage Growth Tracker data who change industry (across manufacturing, construction, retail, etc. ), and the green line depicts the wage growth of those who remained in the same industry. 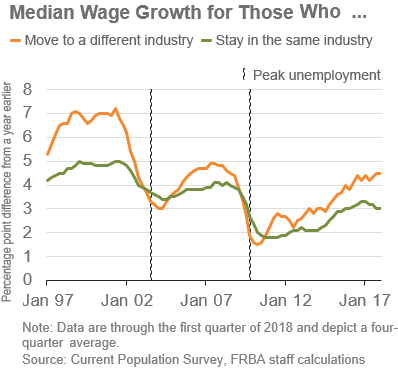 As the chart indicates, changing industry when unemployment is high tends to result in a wage growth penalty relative to those who remain employed in the same industry. But when the unemployment rate is low, voluntary quits rise and workers who change industries tend to experience higher wage growth than those who stay. Currently, the wage growth premium associated with switching employment to a different industry is around 1.5 percentage points and growing. For those who are tempted to infer that the softness in the Wage Growth Tracker might signal an impending labor market slowdown, the wage growth performance for those changing jobs suggests the opposite: the labor market is continuing to gradually tighten. In the second post of this series, I enumerated several alternative monetary policy frameworks. Each is motivated by a recognition that the Federal Open Market Committee (FOMC) is likely to confront future scenarios where the effective lower bound on policy rates comes into play. Given such a possibility, it is important to consider the robustness of the framework. My previous macroblog posts have focused on one of these frameworks: price-level targeting of a particular sort. As I hinted in the part 3 post, I view the specific framework I have in mind as a complement to, and not a substitute for, many of the other proposals that are likely to be considered. In this final post on the topic, I want to expand on that thought, considering in turn the options listed in part 2. The framework I described in part 3 was constructed to be consistent with the FOMC's current long-run objective of 2 percent inflation. But nothing in the structure of the plan I discussed would bind the Committee to the 2 percent objective. Obviously, a price-level target line can be constructed for any path that policymakers choose. The key is to have such a target and coherently manage monetary policy so that it achieves that target. The slope of the price-level path—that is, the underlying long-run inflation rate—is an entirely separate issue. As noted, the flexible price-level targeting example I discussed in part 3 was constructed with a long-run 2 percent inflation rate as the key benchmark. In that regard, it is clearly consistent with the Fed's current inflation goal. Further, a central question in the current framework is how to interpret a goal of 2 percent inflation in the longer run. One interpretation is that the central bank aims to deliver an inflation rate that averages 2 percent over some period of time. Another interpretation is that the central bank aims to deliver an inflation rate that tends toward 2 percent, letting bygones be bygones in the event that realized inflation rates deviate from 2 percent. The bounded price-level targets I have presented do not force a particular answer to the question I raise, and both views can be supported within the framework. Hence, the framework is consistent with whichever view the FOMC might adopt. The only caveat is that deviations from 2 percent cannot be so large and persistent that they push the price level outside the target bounds. As to the problem of the federal funds rate falling to a level that makes further cuts infeasible, nothing in the notion of a price-level target rules out (or demands) any particular policy tool. 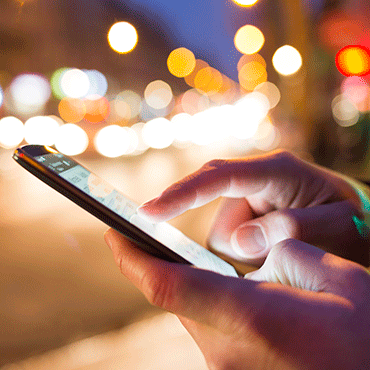 If anything, bounded price-level targets could expand the existing toolkit. They certainly do not constrain it. Targeting nominal GDP growth, which is the sum of real GDP growth and the inflation rate, represents a deviation from the price-level targeting I have described. In this framework, the longer-run rate of inflation depends on the longer-run rate of real GDP growth. To see how this works, consider the period from 2003 to 2013. In 2003, the Congressional Budget Office projected an average annual potential GDP growth rate of 2.9 percent over the next 10 years. Had there been a nominal GDP growth target of 5 percent at this time, the implicit annualized inflation target would have been just over 2 percent. However, current CBO estimates indicate that actual potential GDP growth over this period averaged just 1.5 percent, which would suggest an inflation target of 3.5 percent. As data came in and policymakers saw this lower level of growth, they would have responded by shifting upward the implicit inflation target. For advocates of using a nominal GDP target, shifting inflation targets is a key feature and not a bug, as it allows policy to adjust in real time to unforeseen cyclical and structural developments. What nominal GDP targeting doesn't satisfy is the principle of bounded nominal uncertainty. Eventually, price-level bounds that are set with an assumed potential real growth path will be violated if shifts in potential growth are sufficiently large. The appeal of nominal GDP targeting depends on how one weighs the benefits of inflation-target flexibility against the costs of price-level uncertainty inherent in that framework. Recently, my colleague Eric Rosengren, president of the Boston Fed, offered a proposal (here and here ) that has some of the flavor of nominal GDP targeting but differs in important respects. Like nominal GDP targeting, President Rosengren's framework would adjust the target inflation rate given structural shifts in the economy. However, if I understand his idea correctly, the FOMC would deliberate specifically on the desired rate of inflation and adjust the target within a predetermined range. Relying on the target's appropriate range opens the possibility of compatibility between President Rosengren's framework and the one I presented. Policymakers could use price-level targeting concepts in developing a range of policy options given the state of the economy. The breadth of the range of options would depend on the bounds the FOMC felt represented an acceptable degree of price-level uncertainty. Summing all of this up, then—to me, the important characteristic of a sound monetary policy framework is that it provides a credible nominal anchor while maintaining flexibility to address changing circumstances. I think some form of flexible price-level targeting can be a part of such a framework. I look forward to a robust and constructive debate.